Dresden, one of Europe's greatest Baroque cities, about 30 kilometers north of the border with the Czech Republic, stands majestically astride the Elbe River. It was the seat of the Saxon rulers, who lavished their attention on its riverside palaces and soaring churches and left the city with their vast collections of art and antiquities. This wealth of historic artifacts - it even includes beautifully preserved royal clothing - is displayed today in world-class museums. However rich Dresden's treasures and proud its heritage, modern history has not been kind to the city. Dresden suffered the double blow of almost complete destruction in World War II, followed by 45 years of postwar neglect under the Soviet regime. It's hard to believe all this from the Dresden you see today. It has risen from its ashes and bears few scars from its late 20th-century trauma. Palaces glitter, gardens bloom, and the dome of the magnificently restored Frauenkirche again stands out above the skyline. With its wealth of museums, palaces, and other tourist attractions, there are plenty of things to do in Dresden. But don't spend all your time hurrying between these points of interest; take time to stroll along Brühl's Terrace, admire the river from one of its bridges, and smell the roses in its gardens. Dresden is a gracious and beautiful city to simply enjoy its many sights. Dresden's spectacular Frauenkirche is one of the most remarkable reconstruction projects ever to have taken place in Germany, if not the world. Completed in 1743, the spectacular Baroque original was considered one of the most beautiful churches in Europe. After its destruction during Allied bombing in 1945, the ruins of the old building were catalogued and stored for use in its reconstruction. After the reunification of Germany in 1990, plans to rebuild developed rapidly, and when it reopened in 2005, nearly 4,000 original stones had been included. Topping it all - and as a symbol of international goodwill - was a gold cross provided by Great Britain, whose bomb had wrought much of the devastation. The vast interior is simply spectacular. The restored high altar is a fantasy of Baroque flourishes highlighted in gold, and tier after tier of galleries ring its walls. You can take an elevator to the dome for views of the city, participate in worship services (once a month in English) and listen to one of the more than 100 concerts performed here each year. Stop for a reflective moment to look at the cross that once topped the dome, its twisted remains found amid the rubble. An exhibition describes the reconstruction project, which was funded by contributions from all over the world. Guided tours are available. If you have time to see nothing else in Dresden, it should be this and the Frauenkirche. One of Europe's richest and probably its oldest public museum (although the Vatican disputes this), the Dresden State Art Collection, inside the Dresden Royal Palace, is also one of its most modern and forward-looking in terms of displaying and interpreting its treasures for visitors. Priceless art, opulent court clothing, intricate needlework, even Augustus the Strong's personal garden tools are shown and their significance explained. All the detailed labeling and background information is also in English, and cases housing the dazzling collections from the fabled Green Vault are in non-reflective glass, so you can admire (and photograph) them from all sides with a clear view from every angle. The original Green Vault, largely destroyed with the rest of the palace in World War II, has been reconstructed to house parts of the collection in their original settings. This extraordinary collection includes masterpieces of gold, silver, jewelry, and ivory from the 14th to 18th centuries, all of which had been removed to safety at the onset of the war. From 1485, the castle was the home of Saxony's electors and kings, and it was Augustus the Strong who decided that the royal collections should be open for the public to enjoy. In 1723, he began to turn the formerly private treasure chambers into a public museum. In addition to the treasures of the Green Vault, the Turkish Chamber, established in 1614, houses one of the world's largest collections of artifacts from the Ottoman Empire. Other collections include the Numismatic Cabinet of medals and seals; the Dresden Armory of weapons and armor; and the Print Cabinet, containing graphic art, drawings, watercolors, and pastels by European artists from the 15th century onwards. Not content to imitate the delicate, original Renaissance sgraffito decoration on the exterior walls with painted designs, Dresden has chosen instead to replicate it exactly, and master stone artists are still painstakingly engraving the intricate designs into the stone. In the courtyard, step close to the decorated walls to appreciate the detail of the carved lines. The Zwinger - a magnificent early 18th-century palace in the center of the city beside the Elbe - is one of the finest examples of Baroque architecture in Germany. It's worth walking around the outside just to appreciate its architecture. 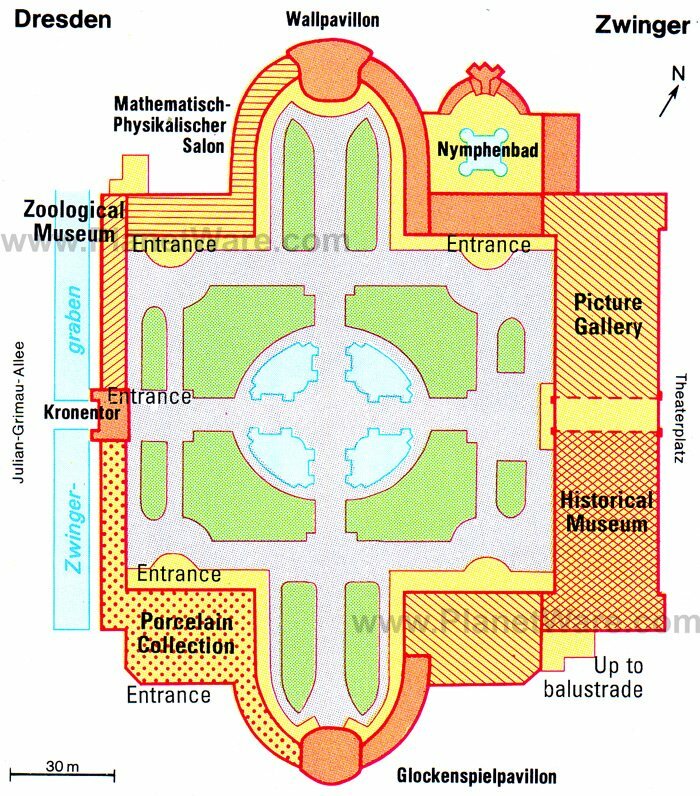 On its south side is the majestic 32-bayed Long Gallery, and flanking it to the east and west are four symmetrically arranged pavilions, the Wallpavillon and the Nymphenbad (Bath of the Nymphs), with its graceful fountains and mythological figures. Aside from its impressive architecture, the Zwinger houses more of the Dresden State Art Collections. These include the Dresden Porcelain Collection, scientific instruments in the Royal Cabinet of Mathematical and Physical Instruments, and the Old Masters Picture Gallery. The latter features paintings from the 15th to the 18th centuries, among them Italian Renaissance and Baroque masterpieces by Raphael, Titian, Correggio, and Tintoretto. The collection of Dutch and Flemish paintings includes works by Rembrandt, Rubens, Van Dyck, and Vermeer. The west side of Dresden's Theaterplatz, one of Germany's finest public squares, is dominated by the magnificent Semperoper, the city's opera house, built in the style of the Italian High Renaissance. To see the lavishly decorated interior, either attend a performance (which include concerts, ballet, and opera) or take a spirited tour led by one of the staff, who will share tales of some of the great performers and guests as you tour. In the center of Theaterplatz stands an equestrian statue from 1883 of King John, and at the southeast corner stands the Altstädter Wache, the Old Town Guard-House, built in 1831 and modeled on the famous Guardhouse in Berlin. To the southeast is the Taschenbergpalais, a Baroque palace dating from 1711. The Georgentor, or Georgenbau, was the original city exit to the Elbe Bridge and the first of the city's many Renaissance buildings. On the west side is a doorway from the original building with its rich sculptural decoration, including an equestrian statue of Duke George. Also of interest is the Langer Gang, a long wing linking the Georgenbau with the Johanneum that was built in 1591. Along its inner side is a long Tuscan-style arcade, with 22 rounded arches, leading to the Court Stables. Its most important attraction, however, is the famous Fürstenzug - the Procession of Princes - a 102-meter-long portrait of the Dukes, Electors, and Kings of the house of Wettin, together with leading German figures from the arts and sciences. Commissioned in 1870, it consists of 25,000 Meissen Porcelain tiles. No trip to Dresden is complete without a stroll along Brühl's Terrace, or Brühlsche Terrasse, also known as the "Balcony of Europe." Approached from the Schlossplatz by a broad flight of steps, this area on the site of the old city ramparts was laid out in 1738 as a private garden, and opened to the public in 1814. The sculptured groups on the staircase represent morning, noon, evening, and night, and the Dolphin Fountain is the only part left of the original garden. Bordering part of this promenade is the College of Art, built in 1894. The Moritz Monument, the oldest one surviving in Dresden, was erected in 1553. Below, the Terrassenufer on the banks of the Elbe is the main landing stage for cruise boats. In the 1720s, Augustus the Strong ordered a pair of Baroque summer palaces built beside the Elbe, where he could entertain at costume parties and sporting contests. Decorated in the then-popular Chinoiserie style, they face each other across a garden. Pillnitz later became the royal family's summer residence, and in 1820 the Neoclassical New Palace was built, forming the third side of the Pleasure Garden. During all this time, the gardens grew and expanded across the estate, each new addition reflecting the tastes and styles of its era, until they stretched across much of the 77-acre park. Apart from the beauty of their design, their charm lies in the way the Baroque, Neoclassical, and English landscape styles merge harmoniously. Wander through them to find hedge gardens; wooded landscapes; an English Pavilion reflected in a lily pond; a Chinese garden: a tropical Palm House, and the garden's prized possession, one of Europe's oldest camellia trees, now almost 30 meters tall. The palaces are worth touring, both for their Chinese-inspired decorations and for the museums they house. The Museum of Decorative Arts and the Crafts Museum contain furniture, musical instruments, glass, pewter, porcelain, and textiles from State Arts Collections, and there is a reconstruction of the New Palace kitchens. You can get to Pillnitz from Dresden by bus, but the best way to arrive is by paddle steamer, floating along the Elbe, under the famed Blue Wonder Bridge and past the three Schlösser (castles) on the Elbe: the late Neoclassical Albrechtsberg, Lignerschloss (built in 1850), and the Neo-Gothic Schloss Eckberg (built 1859-61). Built between 1884 and 1887, the Renaissance Revival Albertinum on Brühl's Terrace is as spectacular as the world-class art collection it houses. The museum is best known for its impressive New Masters Gallery, with its rich collection of works of the Romantic and Realist periods, as well as French, Polish, Romanian, Hungarian, and Belgian paintings of the 19th century and German Impressionists and Expressionists. Artists and styles represented range from Degas and Goya to Max Liebermann. Other highlights are the Sculpture Collection, including examples from Egypt and western Asia as well as Greek, Roman, and Etruscan work. The lovely Great Garden (Großer Garten) was laid out in the French Baroque style beginning in 1676 and has been open to the public since 1814. The Sommerpalais, built between 1678 and 1683, is one of the earliest Baroque palaces in Germany. Also in the park are the Dresden Zoo and the Dresden Botanical Garden, where more than 10,000 species are arranged geographically for a world tour of plant life. A miniature railway, the six-kilometer-long Parkeisenbahn, staffed largely by children, is a good way to get from one attraction to another and to the frequent concerts and performances that are held in the park. Of interest to car enthusiasts is Volkswagen's Transparent Factory, an assembly plant that offers tours of the manufacturing and assembly processes. In the Johanneum, one of the oldest buildings in Dresden's Neumarkt, is the Transport Museum, or Verkehrsmuseum. Historic vehicles, including aircraft, steam engines, cars, motorbikes, and watercraft are displayed in engaging exhibits. The navigation exhibit, entered through a stylized ship's hull, explores 1,000 years of maritime history, its technology, and the people who lived and worked on the rivers and seas. Other exhibits detail the progress of road transport from before the invention of motorized vehicles to the present, and a third follows the development of railways. A model railroad covers 325 square meters, with 26 locomotives pulling 115 cars through detailed models of Saxon villages and countryside. 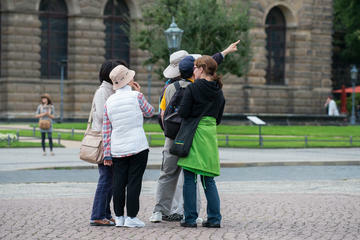 Nearby is the Peace Fountain, as well as the Bundeswehr Military History Museum, the museum of the German armed forces. In the Neustädter Markt, across the river in Dresden Neustadt (the city's newer district) is the statue of Augustus the Strong in the pose of a Caesar, wearing Roman armor and seated on a horse. Made in 1736, it's commonly known as the Golden Horseman and is one of the city's most popular landmarks. It sits at the beginning of a long Hauptstrasse, a wide boulevard with a tree-lined promenade at its center, a popular place for an evening stroll. Also here is the Japanese Palace, or Japanisches Palais, a Baroque and Neoclassical-style mansion, built in 1737. Richly decked with Chinoiserie, it was built to house Augustus the Strong's collection of porcelain (now the Dresden Porcelain Collection), but now houses the State Museum for Prehistory and the Museum of Ethnology Dresden. Another nearby attraction, housed in the 16th-century Jägerhof, is the Saxon Museum of Folk Art. To the southeast of Dresden's old town is Lingnerplatz, home to the German Hygiene Museum (Deutsches Hygiene-Museum), an institution founded in 1912 to promote health education and healthy living. The museum is more interesting than you'd expect from its name - it's really a museum dedicated to medicine and medical practices. Among its many interesting exhibits are the famous Glass Woman, first displayed in 1930; a permanent exhibit dealing with the human race; and a fun interactive children's museum that focuses on the senses. The dazzlingly restored old town (Innere Altstadt) contains Dresden's top attractions and is a convenient place to stay despite its crush of tourists in the summer. 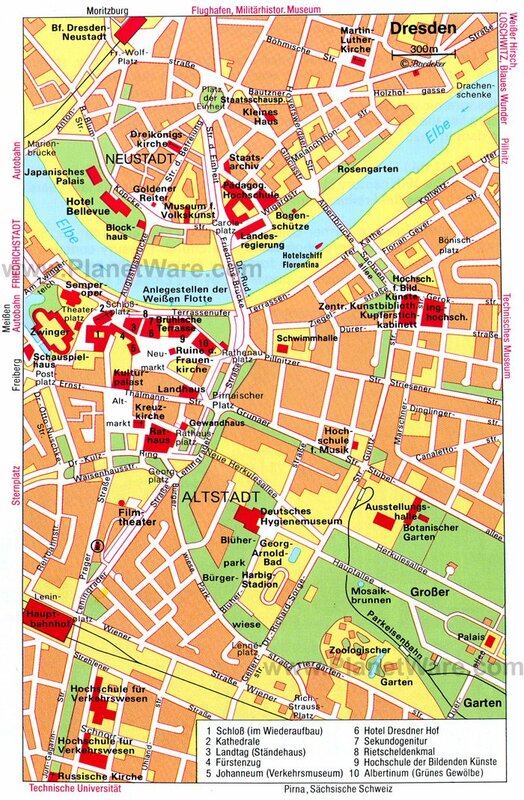 To be within walking distance of the Frauenkirche and Zwinger but away from crowds, consider the Neustadt neighborhood, just across the river and close to the Japanese Palace and folk art museum. These highly-rated hotels in Dresden are all near the major tourist attractions. Luxury Hotels: A few steps from Frauenkirche, in the center of the old town, Hotel Suitess zu Dresden has large well-furnished rooms and superior service. The stylish and almost playful contemporary design of rooms at Swissotel Dresden, between Frauenkirche and the Residenz, is a nice contrast to the surrounding Baroque architecture. A short walk from the Zwinger and historic center, Bulow Palais and its Michelin-starred restaurant are in Neustadt, away from the high-season crowds. Mid-Range Hotels: Offering spacious, modern rooms and on-site indoor parking, Innside by Melia Dresden is a few steps from Frauenkirche. Right next to that landmark church is Hilton Dresden Hotel, with a swimming pool and fitness center. Halfway between Frauenkirche and the Royal Palace, the new Amedia Plaza Dresden offers chic, modern rooms in the Jüdenhof, a building with a rich Jewish history. A few blocks away and overlooking the popular Altmarkt square, Star Inn Hotel Premium Dresden im Haus Altmarkt has large well-decorated rooms, between the historic and shopping districts. Budget Hotels: A block from Altmarkt and a short walk from Frauenkirche, Holiday Inn Express Dresden City Centre is on a main shopping street close to the Hauptbahnhof rail station. Don't be put off by the name of Motel One Dresden-Palaisplatz. It's not a motel but a smart modern hotel with spacious rooms and an accommodating staff, just across the river in the Neustadt. Right at the station, InterCityHotel Dresden is a 10-minute walk from the main sights and the zoo/botanic garden attractions, or take advantage of the hotel's free city tram tickets to go everywhere. Ibis Budget Dresden City is close to the museums of the Zwinger and Residenz palaces and has quiet rooms despite its location in a busy shopping district. Only 30 kilometers to the west and easy to reach on a day trip from Dresden, Meissen was once the seat of the long-reigning Wettin dynasty. They made their home in the Albrechtsburg Castle, which towers above the town and river atop a high hill (the climb through narrow lanes is picturesque but steep - you can avoid it by riding the funicular). Founded in the 15th century, the castle is one of the finest secular buildings of the Late Gothic period, and its most notable feature is its large spiral staircase. Inside, the rooms have richly decorated vaulting and ceilings, with paintings dating from 1870. Adjoining it atop the crag is the Early Gothic Meissen Cathedral, dating from 1260. It is an almost pure Gothic building with nothing but its Protestant pulpit, pews, and organ changed from its medieval appearance. The original front entrance was closed to preserve the early graves in the floor. Meissen has long been famous for its porcelain, and a top tourist attraction is the Porcelain Manufactory. A tour there not only includes a look at examples of their work over the past 300 years, but a chance to watch as skilled artists mold objects, sculpt the delicate blossoms, and figures that adorn Meissen figurines and paint flowers on plates and teacups. The silver mining town of Freiberg, about 40 kilometers southwest of Dresden, is also home to a stunning cathedral, a Late Gothic hall-church with the oldest and largest surviving Silbermann organ in Saxony. The town's historic center is listed as a national monument. About 14 kilometers northwest of Dresden is the remarkable Schloss Moritzburg, an Electoral hunting lodge and summer palace in the ochre and white of Saxon Baroque. Begun in 1544 as a modest hunting lodge, this stunning palace was given its present form between 1723 and 1736, with Baroque statues added on the balustrades of the carriage ramp and terrace. The decoration and furnishings of the interior, including hunting trophies and paintings, are preserved unaltered. Also on the grounds is Little Pheasant Castle, an 18th-century hunting lodge whose extraordinary interior is decorated with rare Rococo finishes - inlaid paneling of exotic woods; mural paintings on canvas; painted and gilded ceiling stucco; painted wood and plaster; faux marble; and walls finished in embroidered silk, feathers, and a remarkable combination of straw and pearls. This rare interior has recently been restored by the World Monuments Fund. A favorite day trip from Dresden is to Saxon Switzerland National Park, only 30 kilometers southeast of Dresden, a wild landscape of soaring limestone pillars, with views straight down to the Elbe. Walking trails form a network throughout the park, with paths for all levels of energy, and since 1898, a little tram has carried tourists between the village of Bad Schandau and the waterfall at Lichtenhain. The most famous sight is the Bastei Bridge, a 76-meter-high stone arched bridge that connects the rock formations. You can hike there or reach it by public transportation. There are several ways to get to Saxon Switzerland from Dresden: by car, by S-Bahn trains that leave Dresden twice each hour, by excursion boats, or by one of the world's oldest paddle wheel steamboats (the most romantic way). 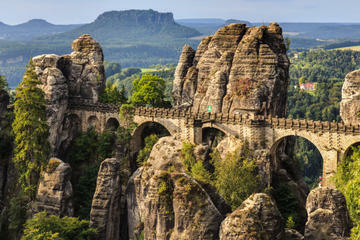 For an in-depth look at the natural wonders of this park, you can take a Bohemian and Saxon Switzerland National Park Day Trip from Dresden, which includes Bastei Bridge, and a trip across the border into the Czech Republic to Pravčická Gate, the biggest natural sandstone arch in Europe. About 90 minutes from Dresden is one of the most fascinating and little-known regions in Saxony, the Erzgebirge, or Ore Mountains. Their long mining history led to a wooden Christmas ornament industry, which has remained active long after the mines closed. The central town in the region is Annaberg-Buchholz, crowned by the magnificent St. Annenkirche, a landmark with its 78-meter-high tower. Like much else in the town, the interior of the church is decorated with exceptionally fine woodcarvings. Opposite is an historical museum where you can enter an actual mine, one of the many that lie beneath the ground here. To see more examples of the woodcarving the region is famed for (many traditional German Christmas folk arts - wooden arches, Christmas carousels, wood-shaving ornaments and wooden angels to name a few - originated here) visit the Manufaktur der Träume (maker of dreams), a museum filled with stunning examples of carved and painted Christmas and other decorations and toys. Just outside the Old Town, the Frohnauer Hammer is a museum that includes a fascinating iron-working mill driven by water power. The leading city in Saxony after Dresden, Leipzig is also a center of art and culture and an easy train or car trip from Dresden. Also to the north and connected by direct rail and highways is Berlin, the capital of Germany and its largest city, filled with museums and art galleries. Close to Berlin is Potsdam, like Dresden a city filled with royal palaces. Between Berlin and Leipzig, the old university town of Wittenberg, the birthplace of Martin Luther's Reformation, lies on the bank of the River Elbe. Not far south of Dresden is Prague, capital of the Czech Republic, crowned by the beautiful Prague Castle.